In morning I use Dermalogica daily microfoliant~ I like to feel really clean in the morning as I tend to get oily while I am sleeping so when I wake up my face are oily this gentle exfoliating cleanser wash away the oil and leaves a smooth feeling. FORGOT to take photos of my makeup cleaner D; Before cleaning my face with a cleanser I use DHC mild cleansing oil to remove my makeup first this way my face is makeup free before I cleanse my face with my Clarisonic :) I am not a big fan of this cleansing oil cause it doesnt wash off clean but still leaves a oily feeling so not a big fan.. but I do recommend their original DHC Deep cleansing oil instead! 3. Moisturizer: *Only at night I apply Ole Henriksen Truth serum, I have love hate relationship with this serum... I really love that it makes my skin really supple and moist but I cant wear this often or it makes me breakout so I only use it at night as a added moisturizer for my skin as I cant use creams or it'll make me breakout so I have to stick with serums to moist my face. Yay, this is so interesting! I am very curious about your foaming cleanser with the Clarisonic. Is your cleanser a cream/gel that foams when you rub it into your skin? I'm having trouble using my Clarisonic with my Anna Sui foaming cleanser. It's a liquid in the bottle but when it comes out of the pump it becomes a foam. When I use my face or a silicone face cleansing pad, one pump is plenty for my whole face, but when I use the Clarisonic, I run out of foam after one cheek! 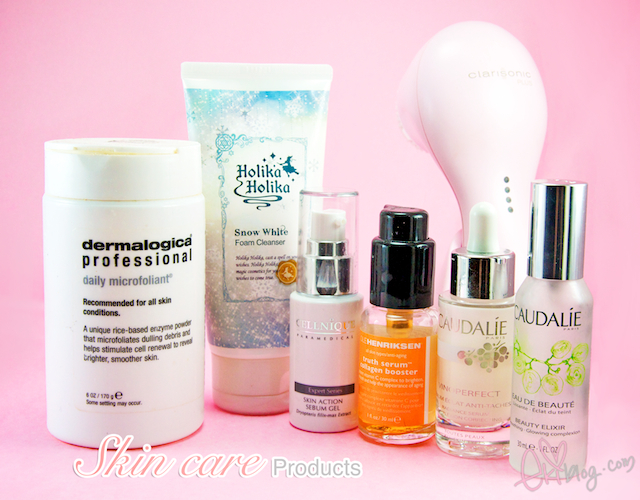 So I'm very curious how you use your foaming cleanser with the Clarisonic! I'm with you - love Caudalie products and Clarisonic! I love the Ole Henriksen Truth Serum. I didn't break out from it and it really makes the skin supple and glowy! Nice routine..
interesting picks... they are all new to me. since I've never heard of those brands before. 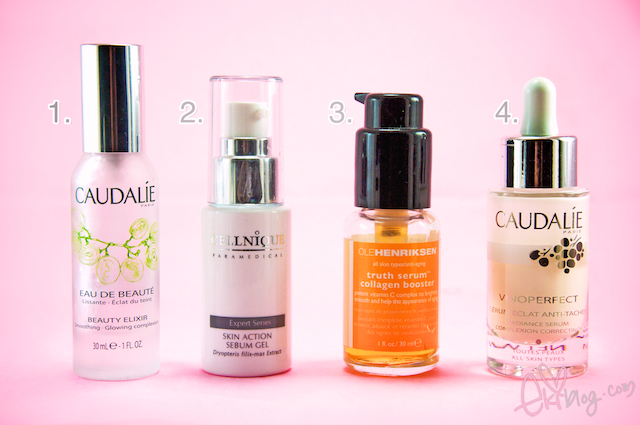 I'm really tempted to try the Caudalie products now though ♥ I have the same issues with oily skin & uneven skin tone so I could definitely benefit from some of these! i want to have a clarisonic too!!! is the foam cleanser good??? where can i get it? I would love to try Caudalie products - I've been hearing all sorts of great things about them~! Hi! Saw this poster on https://www.facebook.com/shop.prettylove?sk=info and it makes me think of you immediately. Is that your shop? We have the same issues with my skin. I am also prone to breakouts. And I agree with you, gentle exfoliating does the trick in removing those unsightly blemishes. Hey thanks for the great ideas ^^, my skin is more combination/oily, and lately I've been getting really bad break outs that leave long lasting scars >.< unfortunately.... Have you tried any cheaper products that have worked with your sensitive skin, and also, do you just buy your skin products online or get it at a local store? Thank you for always openly sharing your beauty regimen! Your skin care reviews are always interesting. I can see that you're a big fan of moisturizers. How many times do you recommend girls with dry skin to moisturize? Thanks! I'll definitely try these. I've been taking a beating from all the work stress lately and I think it's taken a great toll on my skin. I hope it works for me as it did for you!